The last month of the year is a whirl of color, family and friends, winter wonder, and cozy holiday decor. Time to hang up the mistletoe, deck the halls and spread good cheer. But, how do you get into the holiday spirit without damaging your apartment? Santa leaves coal in the stockings of naughty boys and girls. If you are naughty, your apartment community won’t leave you anything when you move out. You will leave your deposit there! 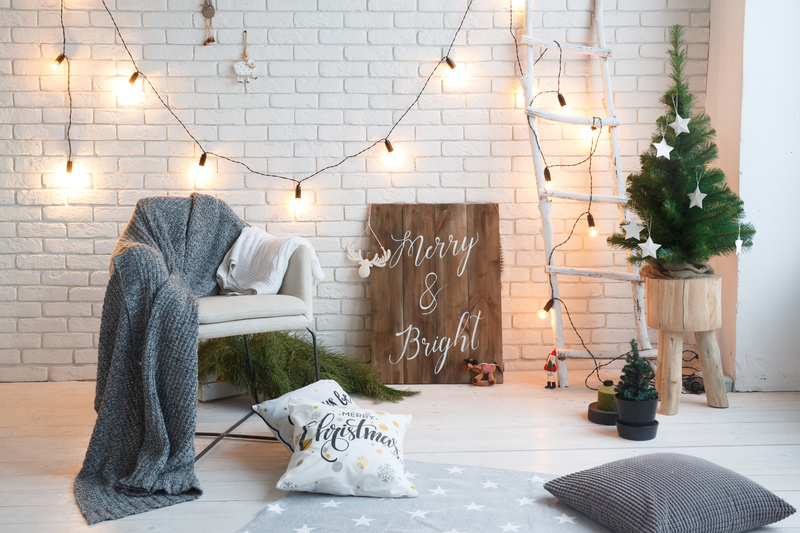 Read on for our tips for fun, festive and damage-free holiday home decor. Are you in favor of a Victorian Christmas look? Or is a Mid-Century modern holiday more your style? All one color or many colors? Candlelight or Vegas-style? Choose a holiday style to personalize your apartment decor. You can add a designer touch with throw pillow covers, table runners, wreaths and candle rings. Lights and other accessories add to the look. Watch out for visual overload though. Choose your accent colors and patterns with care. Even the largest space can’t accommodate three tapestries, five plaids, and multicolored glitter! While many apartment communities don’t allow real trees due to fire code, there’s still hope. Artificial trees are a great option for those who want a tree. The bare aluminum Festivus pole need not come to mind (although it would be a fun holiday decoration!). Newer trees come in tall narrow “candle” shapes, half rounds and other shapes to fit any space. Or, a table top tree can be the perfect touch without taking up too much space. Holiday decor doesn’t always mean a tree though. Garlands and holly are an excellent way to liven up any room. You could also decorate your houseplants by throwing on some garland and ornaments. Just be sure that your plants are pet-safe so your furry friends can enjoy the holiday too. There are a variety of colors, shapes, and sizes when it comes to decking the halls. LED string lights can add just the right amount of sparkle to your holiday home. You can choose string, icicle, net, or curtain lights. They come in an array of colors and lengths. Don’t limit lights to just a tree though. Think about windows, doors, and art, too. Some lights also have an option for movement or music. You can go with a soft glow or a full Vegas light show. Think about battery-operated tea lights to take the place of candle flames. There are even flame-flicker LEDs for safe looks without heat or worrying that you’ll forget to blow them out. These products are lifesavers. Avoid nail damage to your walls and subsequent patching plaster. Removable damage-free adhesive allows you to hang stockings, lights, garlands, and even the mistletoe without a single hole in the plaster. Invest in the outdoor hooks or an over the door hook to hang your wreath. You can even create a mock mantlepiece for your stockings with a simple accent shelf. Just take your time in removing the removable wall hooks to prevent paint damage. We hope these holiday decor tips are helpful to you. The holidays are a very special time for friends, family, and community. We hope to see you at our holiday open house this year. Keep reading our blog for up-to-date community news and tips.